This program corrects the nominal condition cooling performance of the air-conditioners and air-to-air pumps to actual condtions (outdoor air temperature, indoor air temperature, air flow rate). Values used are those presented in Table 5.3 of HVAC Simplified. 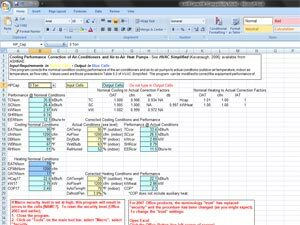 The program can be modified to correct the equipment performance of other manufacturers by changing the published nominal capacity, demand and air flow rate values in the ‘MgfData’ worksheet.